The Relative Humidity (RH) may be defined as the amount of moisture in the atmosphere as compared with that of complete saturation at the given temperature. Water exposed to the air gradualy evaporates until saturation point i.e. the highest quantity of evaporated water which the air may retain. At saturation point, the slightest drop in temperature will cause condensation. This is known as the dewpoint, and corresponds to 100% RH. The amount of water present in the air at 100% RH is approximately 15 grammes per cubic meter. At a Relative Humidity of 70%, the amount of evaporated water is approximately 10.5 grammes per cubic meter. 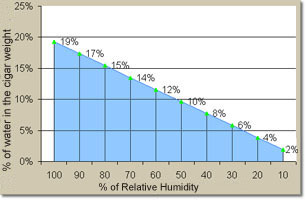 Why create a humid environment with a constant Relative Humidity of 70% ? Cigars are naturally hygroscopic products. In common with many organic substances, they dry out in the absence of humidity in the air, or absorb moisture from the ambiant air. They establish an equilibrium with the atmospheric humidity which surrounds them. A dry cigar burns too quickly. the temperature at which combustion occurs is too high as it is not tem-pered by the natural moisture of the cigar. The smoke is hot and acrid: the cigar becomes agressive. A damp cigar does not burn easily. It becomes difficult to draw on and craters occur at the combustion point. The smoke is heavy, the aroma pungent and tart. For a pleasant smoke, a cigar should contain a certain amount of moisture which corresponds to 13-14% of its total weight. Thus, the combustion is regular. The draw is easy and the smoke blueish and light. The aroma of the tobacco is fully developed whilst the irritating effect of the smoke is moderated by the humidity of the cigar itself. 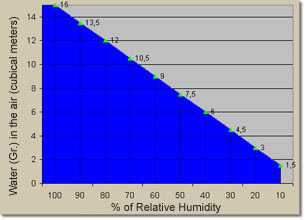 The ideal moisture contents of a cigar (13 to 14%) corresponds to a Relative Humidity of 70%. 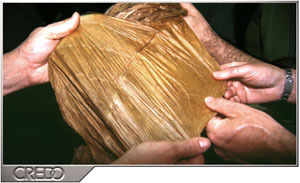 This is why it is necessary to maintain the Relative Humidity of the atmosphere in which cigars are stored.